Start with a Story is Alameda County project that involves the two county jails, Santa Rita Jail, and Glenn Dyer Jail. These programs give out free readings, free books, and family literacy activities to children who are waiting to visit their incarcerated parent. Volunteers read to children on Saturdays and Sundays. This organization targets and assists a niche group of people: children with incarcerated parents. There is not much awareness in our community about the issues and hardships these children face. As a result, they become an extremely underrepresented group, often pushed to the side by their fellow peers. The children of incarcerated parents are often put into unfortunate circumstances, even though many factors were out of their control. According to the Annie E. Casey Foundation, parental incarceration often results in financial instability, unstable peer and community relationships, and poor school behavior. In addition, they face a lot of shame and social stigma because of their family situation and they are less likely to create meaning emotional bonds with other due to how they are treated. Start With A Story hopes to increase the opportunities these children have and instill a passion for reading and learning in these children. They primarily focus on reaching out to younger children, who often have to wait for hours on end to see their incarcerated parent(s). 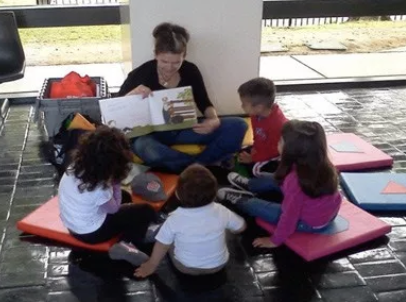 By providing a comforting and supportive environment for the children while they wait for their parents, Start With A Story has positively impacted the lives of numerous children across our community.